The next day was a Sunday, I was at work all day and Bailey was with family. She was unable to walk at all and laid on the couch most of the day. The next morning, Monday, September 29 2014, I called her primary care physician for a sick visit, knowing something was wrong but had no Idea what. By the time I got her ready to go, she had a fever of over 104.5 and was projectile vomiting. I was scared and felt helpless. At this point my daughter was becoming lethargic and weaker in all of her limbs, especially her legs. When we arrived at the doctor’s office and they saw her condition, they sent us directly to the ER where they immediately transferred Bailey to the University of Michigan Ann Arbor Children’s Hospital. Unfortunately, once there, they told us that they thought she might have a virus that is going around and there was nothing they could do there to help her. It was a horrible feeling. Scared, I just held her very tight in my arms, called her dad at work and family that wasn’t already there, to let them know what was happening. We were being transferred to another hospital, C.S.Mott Children’s Hospital in Ann Arbor. I didn’t know what to think about this “virus” as I had no idea that one was going around or one this serious or deadly. A few hours later, we arrived at C.S. Mott Children’s Hospital as Bailey slept, even more weak, and just as scared as I was. She has never had to be in the hospital or get any ‘pokes’ besides her regular vaccinations. There were doctors everywhere, coming and going, talking to her dad and I about what type of tests they wanted to do on our baby to see what was going. Bailey had to have tons of blood work, nose swabs, x-rays, a spinal tap, an MRI, and other physical tests done from the moment we got there. On September 29 2014, our daughter was diagnosed with a terrifying virus called Entero Virus D68 and Transverse Miletus. 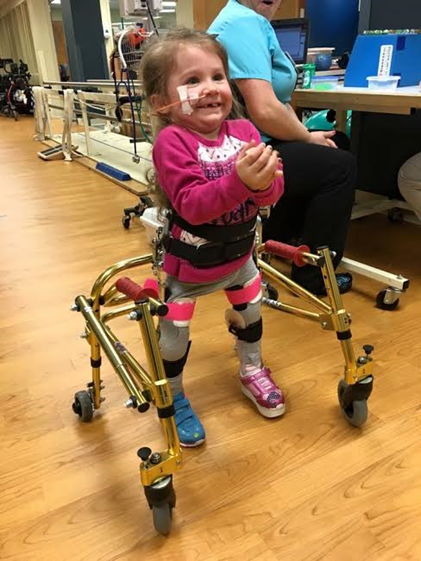 They gave us one option and said, “This treatment will either work and help her body stop the virus from going any further, or it will not help at all.” At this point, Bailey needed to be on a heart monitor, could not walk, and could not sit up on her own. One of the doctors pinched both of her thighs to see if she could feel anything and she felt nothing. The next thing would have been putting a breathing tube in because the virus was continuing to go through her body and shutting it down. So we went with the only option we had for our baby girl and started the treatment which was IV IG. We were in quarantine for several days because this virus was very contagious. Everyone that came and went had to wear a gown, mask and gloves for Baileys safety and their own. Slowly they we able to stop the virus destruction of her body and she started Occupational and Physical therapy while we were at the hospital. On October 10 2014, we finally were released and came home to a completely different life than when we left. Our 1 year old who was going to be 2 on November 29th, and she could not sit up, walk, crawl, or get around on her own at all like she had been doing since she was 10 months old. It was very difficult for all of us especially her because she did not understand what was going on and would get upset when she realized she could not even sit up. But we knew as her parents, we had to be strong and show her that was the only way to get through this. We continued therapy closer to home and still continue it to this day. Since Bailey was diagnosed with the Entero Virus D68 she has had multiple surgeries. She has had a Chiari Decompression (brain surgery), because they found during her MRI that she had Chiari Malformation. The virus made it significantly worse causing fluid build up on her spine. She also has had 3 hip surgeries to fix the bones that were moved out of place and the tightness of muscles and tendons because of the virus. The virus also has made her immune system very weak. She gets sick a lot, is dehydrated very easily and has developed a food aversion. Because of this, she has had to have an NG tube placed for nutrition, because she was not gaining weight. She would hardly eat or drink anything, which resulted in her having to have mouth surgery because the roots of her teeth were decaying. It was horrible. We also went to a feeding program to help her learn how to eat again, but at a much higher age level than when she was a baby learning to eat. This helped her gain enough weight to have the tube removed, and today she continues to gain weight. Bailey is now 4 ½ years old, goes to preschool in our hometown and will be starting young 5’s next school year. She uses a wheel chair to get around, and also has AFO braces to help stabilize her feet for support. She has RGO braces to help her walk. She walks with a gate trainer (walker) and has physical therapy 2-3 times a week, along with what we do at home. She is not walking with her walker all the time yet, as it does cause her pain to be standing for long periods of time. I believe she will be using it a lot more in the near future as she is getting the hang of it and can deal with the pain better. No one can comprehend how this has impacted our family. It is so true when people say, ‘you don’t and can’t understand what someone is going through until you have to go through it yourself.’ We know this will continue to be a long journey for all of us, AND we know we have to stay strong for Bailey. She needs to know that we are behind her, supporting her and lifting her up every single day. We want her to know there is always hope. Bailey still has some weakness in her right arm and has paralysis in her right leg. We believe that one day our big, strong girl will walk on her own two feet, without braces or walkers. We also know that if she does have to use those for the rest of her life, she is no different than anyone else in the world. She survived a tragic and debilitating virus that hopefully other children will not have. The Entero Virus D68 killed several children in the U.S. and in Michigan specifically that year. Bailey was one of only a handful of children paralyzed from the virus. Since 2014, there have been a few outbreaks of the virus with the same outcomes. No doctors to this day can tell us how she contracted the virus or what her prognosis is. We just have to live every day with what we have and do everything we can for our strong, smart, beautiful girl. We will always have HOPE for our Bailey. She continues to be our HERO. She is an inspiration to us and others. We are so proud of her. We cannot imagine how her little body feels on a daily basis. We hope her story brings light and love to whatever life is throwing at you. Visit our Facebook page at "Baileys Battle" to learn more about Bailey’s progress.